Homeowners with a pool know you don’t have to get into the water to enjoy a pool. Just the sight of the water is soothing and tranquil — especially if you have pool lighting and sit by the pool at night. If you swim, you enjoy your time in the water, but you still likely spend more hours near the water than in it. The right deck situated perfectly near the pool can be the best place to spend your pool time. If you have younger children who require supervision while swimming, the layout of your deck in relation to the pool is very important. Let’s look at the decisions you’ll need to make about your new pool deck. Every decision is an opportunity to consider a variety of ideas. Designing a pool deck is more than a one-step process. Here are some of the individual design decisions you’ll need to think about. We’ll walk through these with you when we meet and suggest options you may not have considered. Room for dining and lounging or just lounging? Decking boards — wood or composite? Railings — will they be needed? The design of your pool deck is partly determined by the topography of the land between the pool and your house. Will your deck start low to the ground and be terraced up to a level that allows you to look down toward the pool? We’ve designed some beautiful, low decks that flow seamlessly from the deck to the pool area. Or will you need stairs to climb from the pool up to the lounge or dining area on the deck? Are you thinking about a multi-level deck? You may want to furnish the lower level with waterproof chairs and lounge chairs while restricting the upper level to people who are not dripping wet. A multi-level deck is also great when you’re entertaining a large group and want more than one seating or lounging area. 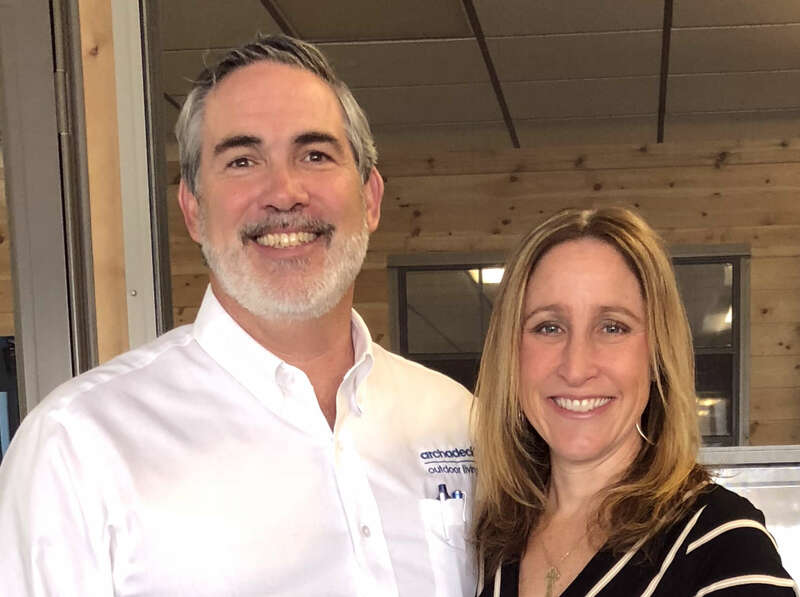 We will talk with you at length about how you intend to use the pool deck because that will be important in determining the size deck you need. Dining can take up more space than lounging, and you may need a deck with room for both! Wood or composite: Traditionally decks were made of wood, but it’s likely you’re familiar with the newer low-maintenance composite decking materials. We work with composite decking boards from several manufacturers, and each company offers several lines at different price points. We recommend you consider composite decking for a pool deck because UV rays and water from the pool will warp and aggressively age a wood deck. A composite deck is splinter-free, and many of the composite decking boards are designed with texture that is slip resistant. Railings: The height of your deck will determine whether you need railings. If you have a terraced or multi-level deck, you may only need railings on the higher levels. Several railing companies offer railing systems with slender profile, dark-colored pickets that practically disappear when you look through them. Colors: With regard to deck colors, you have the option of staying with one color throughout or choosing two colors for a design with a contrasting pattern. One consideration is the temperature of the deck surface for tender little feet. Lighter colors usually don’t retain as much heat as darker boards do. Lighting: Adding deck lighting will give you a great deal more time to enjoy your pool deck. Even if you don’t swim at night, that’s the perfect time to sit out near the pool and enjoy the mesmerizing play of light on the water. Deck lighting also serves as a safety feature. We recommend subtle down-lights under the railing or on railing posts for ambiance as well as lights under stair risers for safety if you have stairs. Grill area: If you plan to dine on the pool deck, a bump out for the grill will allow you to keep it nearby without it being in the way. This is especially important if you have children weaving in and out among adults and deck furniture. The grill master may want a space apart from other activities. Shade structure: A pergola is a beautiful addition to a pool deck, and it’s also practical because it provides some shade. The width and number of slats and rafters along the top of a pergola affect how much shade it provides, as does the north-south orientation. If you desire a pergola that casts more shade, or provides complete shade, we can show you several design options that will create more shade. Since a pergola usually doesn’t cover the entire deck, you can situate it so you have shaded and unshaded areas on the pool deck. We love the beautiful profile of a pergola when you look back toward the house from the pool, too. Low maintenance railing When selecting deck materials, decking boards are a primary component along with deck railings. Like with your decking boards, you have the option to upgrade to low-maintenance materials. The benefit of using low-maintenance is that you never need to do annual maintenance — ever. No pressure washing, no scraping, no staining and no sealing. Maintenance is especially difficult on deck railings because of the of the number of spindles and the fact that you need to alternate from inside to outside to provide maintenance. There are a number of low-maintenance options that include vinyl, aluminum, composite, cable rails or even iron railing. Pressure-treated wood is also a great option but will require annual or bi-annual maintenance. Color options Gone are the days of shades of tan for railing options. You can now choose from many different shade families. Of late, dark black railing spindles are very popular and for good reason. A dark-colored, slender profile railing draws your eye beyond the railing whereas a light colored thicker profile railing spindle does not draw your eye beyond. There are benefits of seeing through the railing both from the inside and outside the deck. It’s great to see out into the yard when sitting upon the deck. For those in the pool, they’ll be able to see onto the deck as well. Depending on the height of the deck and on the local building codes, your deck may be eligible to have some portions of it that are railing free. Often this height needs to be lower than 36" but it does vary based on local buiding codes. An area of your deck that is free from railing blends the experience from the deck to the space beyond. As you see, with all of these variables and individual design choices, no two pool decks are alike. 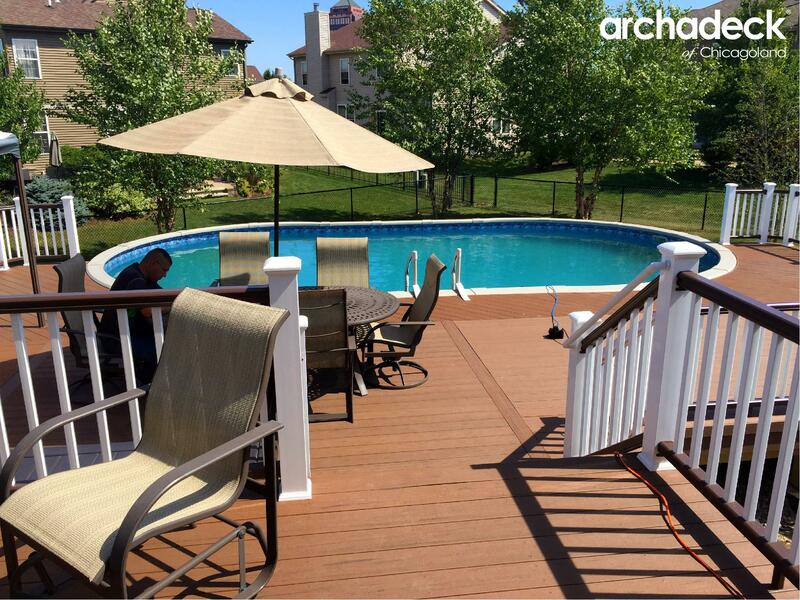 Archadeck of Chicagoland wants to make sure you get maximum usage from your pool deck, which is why we’ll ask so many questions about how you intend to use it. If you’re thinking of adding pool deck to your outdoor living space, we would love to hear from you! 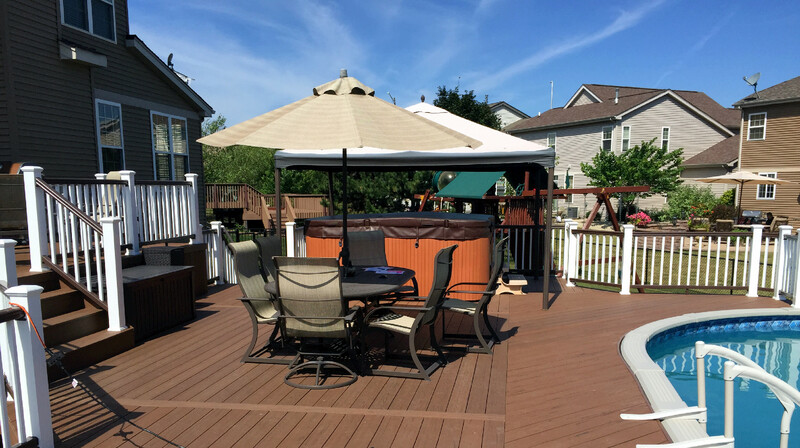 Call us for a free Archadeck Design Consultation at (847) 496.4333.